Many aspects go into placing an item into the consumer market and how you portray this merchandise affects branding. Marijuana products are no different than any other product on the market when it comes to labeling. Label packaging is not just about the design of the label or what it is attached to, but also how everything works together with packaging performance. Each part must fit together perfectly much like a puzzle to be entirely effective. While some might say that appearance is not a big deal, it can be a deal breaker when customers are choosing between products. Performance, functionality, and appearance definitely drive consumers to purchase; however, the look of label packaging is equally important. Below we take a look at some crucial factors in selecting labels for marijuana products. Environmental factors – if the label be exposed to moisture, or changing temperatures a particular adhesive is required to withstand these environments. Shelf life – the proper label should be made with the material and adhesive to exceed the expected shelf life of the product. Legibility – be sure to have your labels made from materials that keep the print legible in difficult environments. Wear and Tear – the best label materials will not peal or tear easily throughout the life of the product. Appealing design – the best label will not only have the right material, but will have an appealing design for consumers. Looking for Medical Marijuana Product Labels? If you are new to the marijuana industry, or if you are just looking for the best labels for your products, look no further. At Flexo-Graphics, our team has been helping suppliers get the most from their packaging and labels for decades. 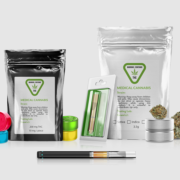 We will help you choose the right materials and processes to gain appealing, durable, marijuana product labels. Choose a custom label with high-quality materials to stand out from the competition and set your brand apart. Our team will help you in the journey to finding the perfect labeling solution! Call us today, or fill out our contact form here.